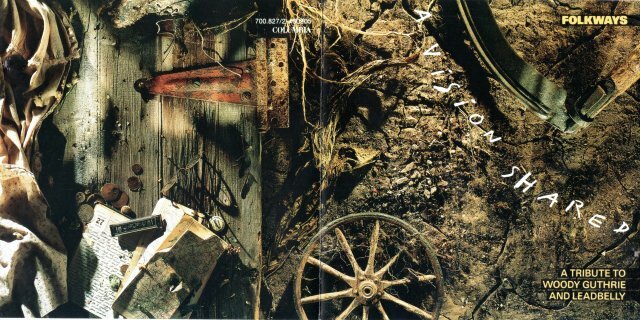 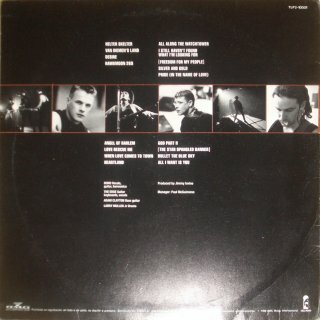 For the album and earlier singles, see 1987. 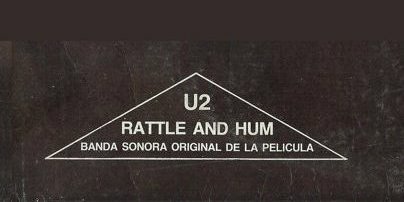 There was also a 12" promo single (PR 2216) that has only the title track on both sides, and a US promo CD (PRCD 2216) that also has just the title track. 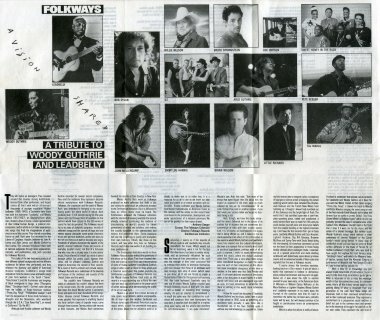 These are not Dylan rarities. 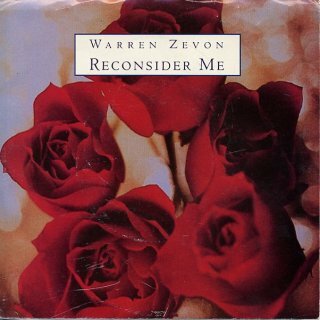 Reconsider Me was also available in the UK as a 12" single (VST 1055, scans required) and a 12" white label promo. 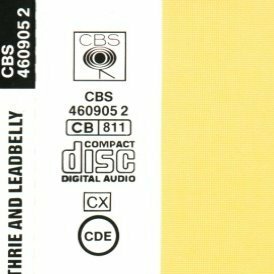 The white label promo, which I also have, is in a plain white sleeve, and has completely blank labels, with just the matrix numbers VST 1055 A/B on the record itself for identification. 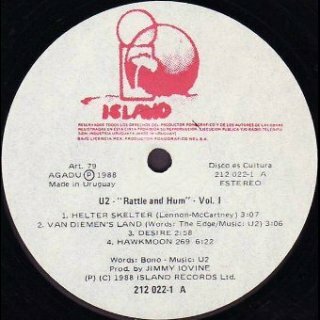 The B-side has R-0190 and a track called Bad Karma. 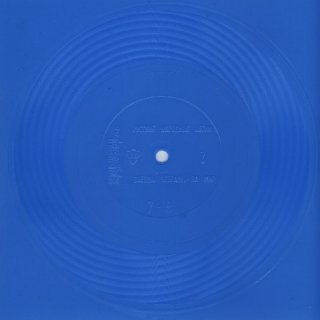 This single was released in Russia in Mar 1988 as a clear blue flexidisc given away with a magazine in a transparent plastic sleeve. 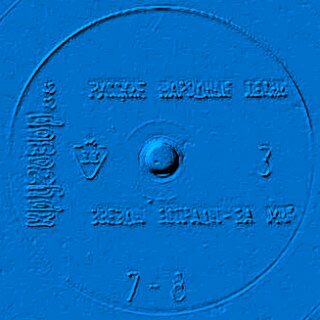 I've used a digital effect to show the stamping in Cyrillic characters on the flexidisc. 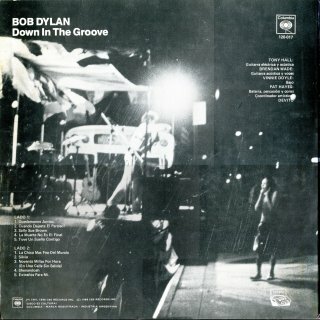 Many Dylan flexidiscs appeared in Russia, but this is one of only two that were official! 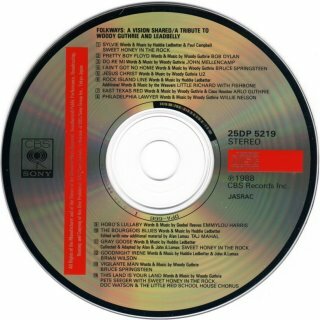 For previous releases of We Are The World, see 1985, 1986 and VHS & DVD 1980s. 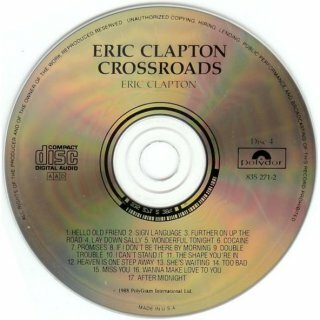 R-0122-3 Sign Language - Bob duets with Eric Clapton on this version of his otherwise unreleased song from Eric's 1976 RSO album No Reason To Cry. 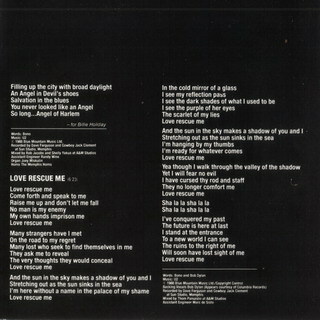 Also see 1976 for all other releases of this track. 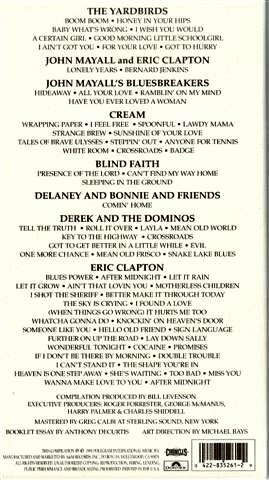 The 4CD version of this set was issued in Oct 1990 with all tracks reportedly remastered, as are those on the 1996 CD release of the original No Reason to Cry album. 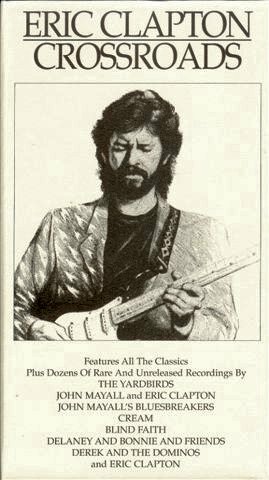 12" box sets information and scans from John Hamilton's "Ultimate" Eric Clapton Discography Thanks to Jack Guerreiro for scans of the current US release (date? 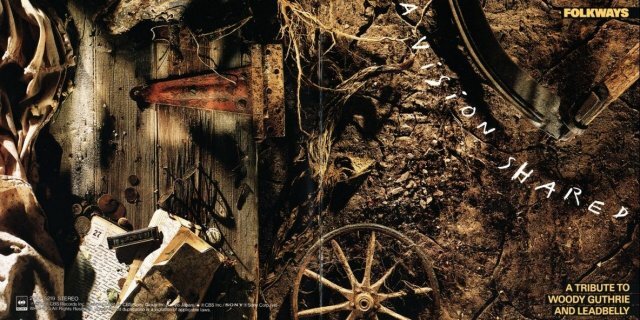 ), in a book-style digipak. 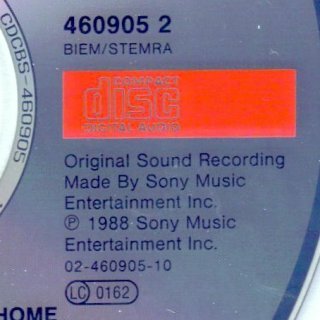 Disc 4 with R-0122 is numbered 835 271-2. 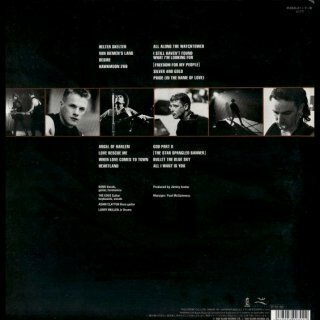 For the released album, see International Albums (Regular). 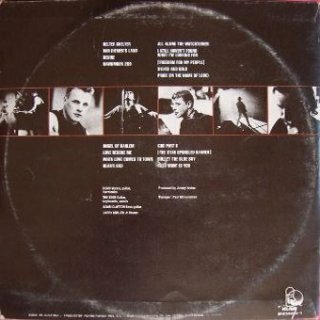 These latter two tracks were instead of Death Is Not The End and Had A Dream About You, Baby (the second version, not R-0193 from the Hearts Of Fire soundtrack, see 1987). 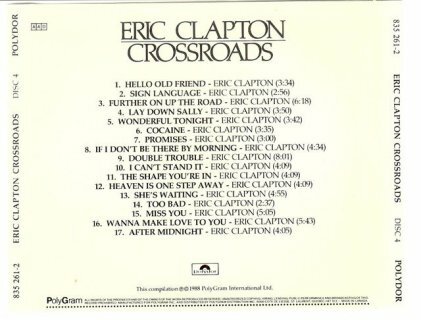 This LP (mispressed to be the same as the second Down In The Groove test pressing, also see 1987) has nothing on the sleeve or record labels to indicate the track changes, it just lists the regular tracks but plays the replaced tracks - information from Sam C. Visser and Hermann Rechberger. 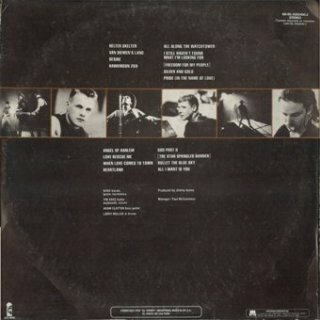 The record with the rarities has matrix numbers: Side 1 - AL 40.957, Side 2: BL 40.957. 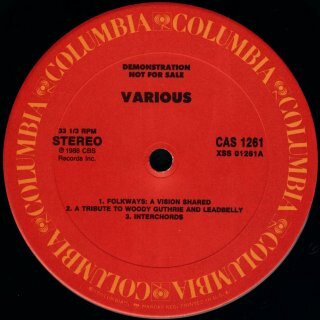 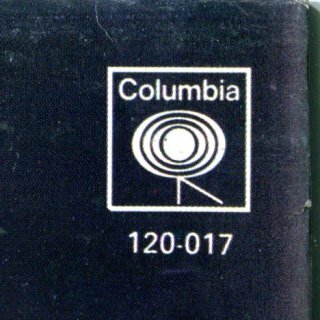 The front sleeve has the title down the left hand side instead of down the right hand side as the US release and the Columbia logo on the right hand side. 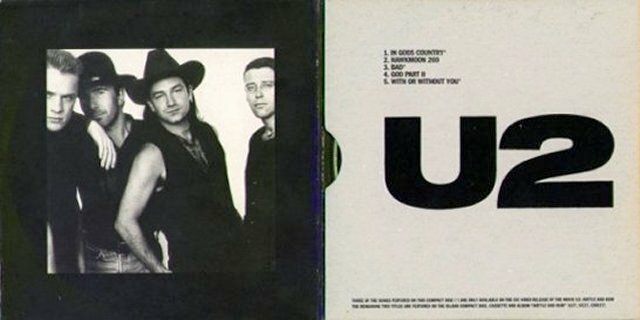 The rear sleeve has the same picture as the US release but in black and white. 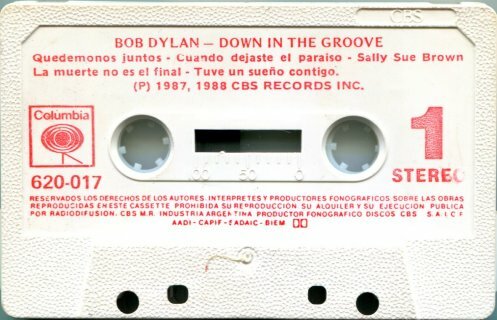 The titles are translated into Spanish with the exception of the names Sally Sue Brown and Shenandoah. 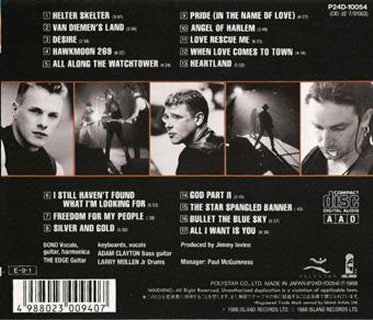 Another difference from the US release is that the musicians and producer are listed on the right hand side of the rear sleeve. 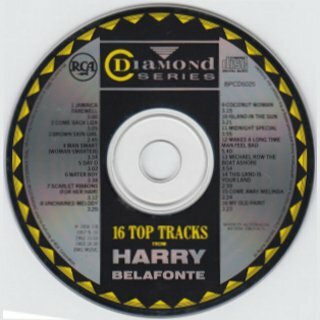 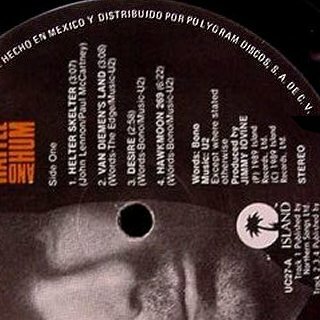 On the record labels the tracks are listed both in Spanish and English. 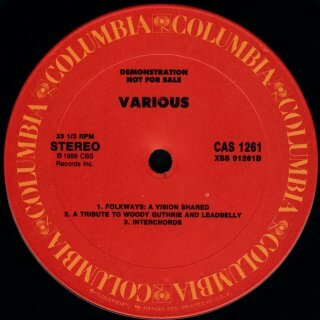 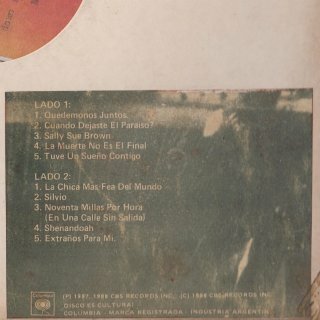 Lars M. Banke has a test pressing of this album in a white card promotional sleeve with a sticker on the rear sleeve listing the Spanish titles of the regular tracks. 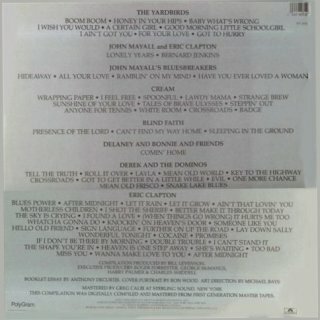 The track listing is actually: Side 1- Let's Stick Together; When Did You Leave Heaven? 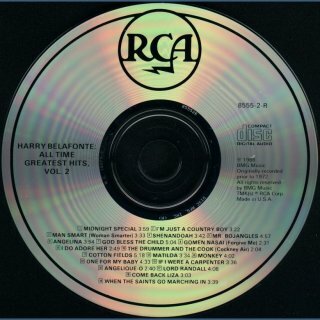 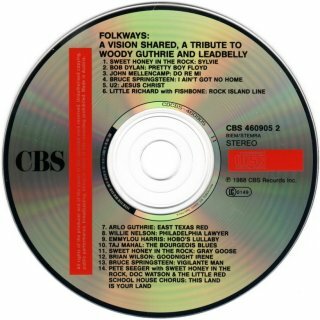 ; Got Love If You Want It; Ninety Miles An Hour; Sally Sue Brown, Side 2 - Ugliest Girl In The World; Silvio; The Usual; Shenandoah; Rank Strangers To Me. 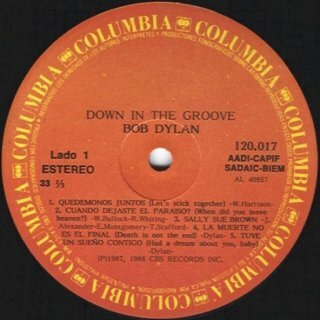 The record has Discos CBS labels with typewritten album information typed at 90°. 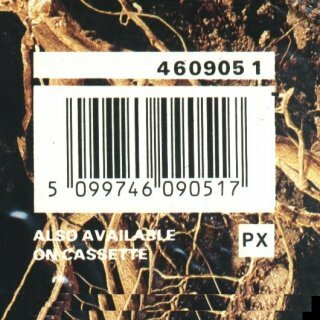 Each side has two stickers, one with "306", which may be a radio station catalogue number. 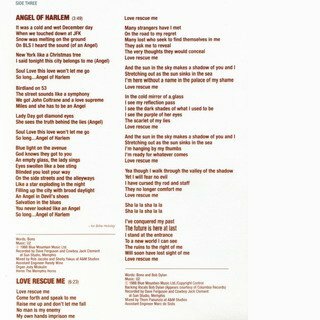 Thanks to Sam C. Visser, Hermann Rechberger, Sergio Mariano Romay and Lars M. Banke for information and scans. 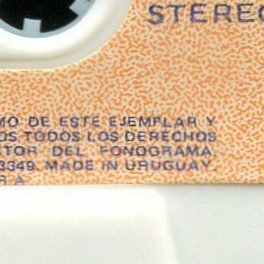 Columbia 620.017 (Argentina) - outside of cassette insert, scan by Sergio Mariano Romay The commercial Argentinean cassette release also plays the replaced tracks as on the second US promo cassette, see 1987. 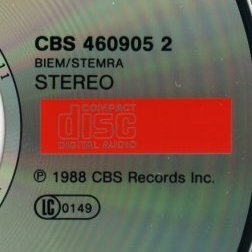 I have no information about an Argentinean CD release (if there was one). 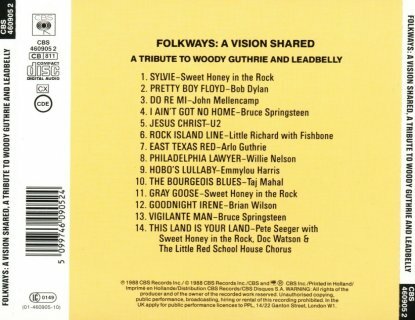 The song titles are the same as those of the regular release. 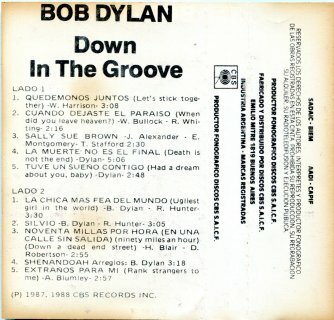 There is a short insert with the song titles in Spanish on the outside and in English and Spanish on the inside. 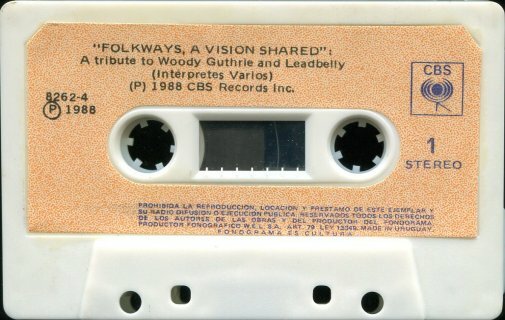 The cassette is white with red text printed directly on to it, there are no paper labels. 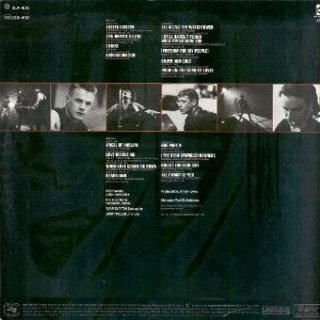 Again the song titles are the same as those of the regular release, listed in Spanish only. 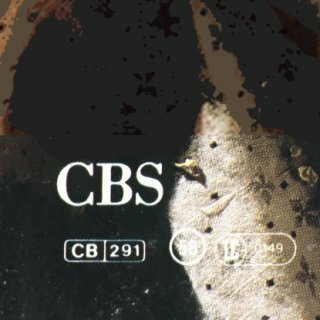 The clear leader tape has CBS logos. 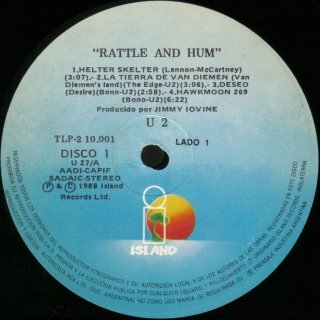 Thanks to Keith Venturoni and Sergio Mariano Romay for information and scans. 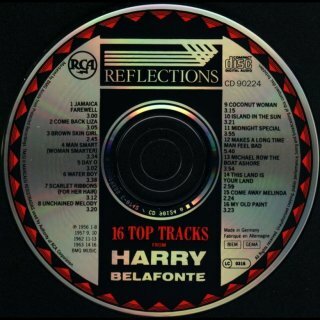 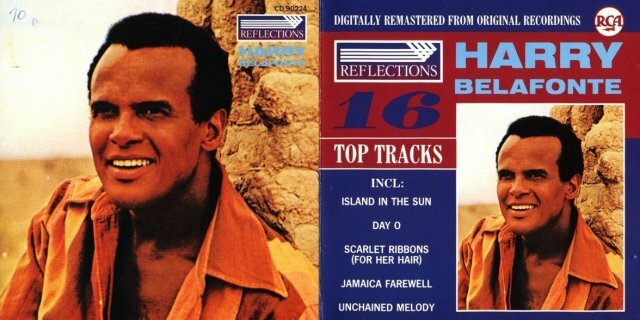 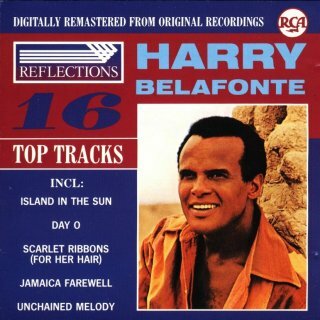 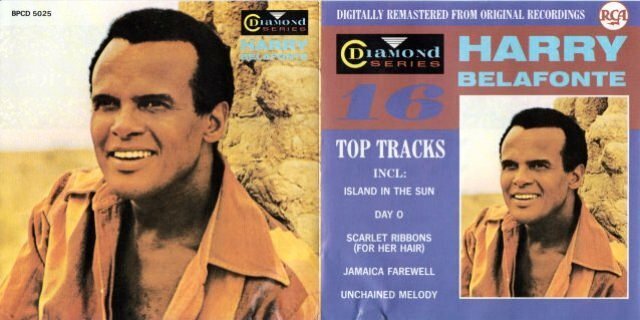 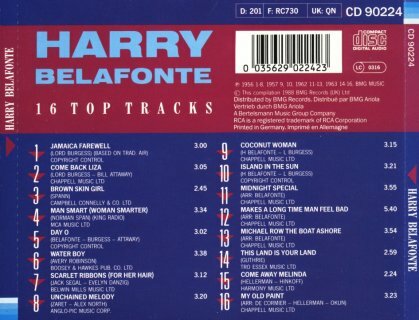 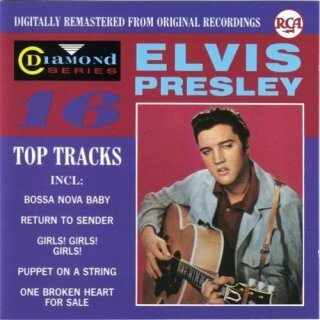 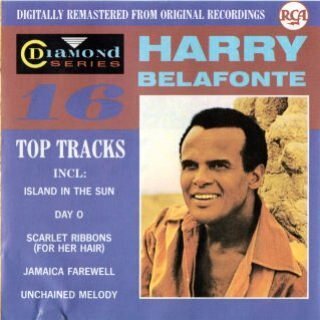 In Germany this album was in the "RCA Reflections" series while in the UK and Australia the series was called "RCA Diamond". 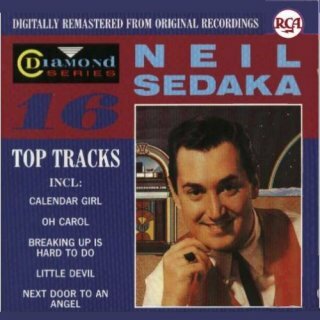 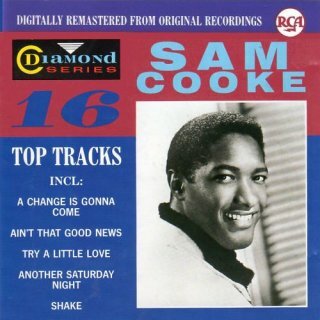 Other artists included Elvis Presley, Neil Sedaka, Sam Cooke and Mario Lanza. 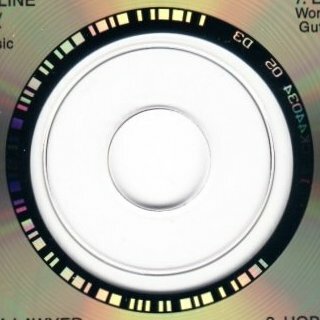 The Australian CD was made in Australia for RCA/BMG by Disctronics. 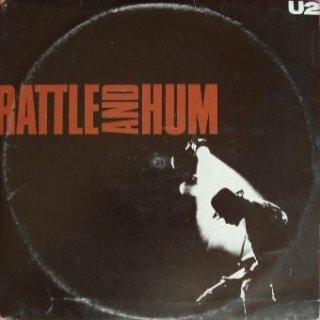 These are both on Side 3 of the 2LP set. 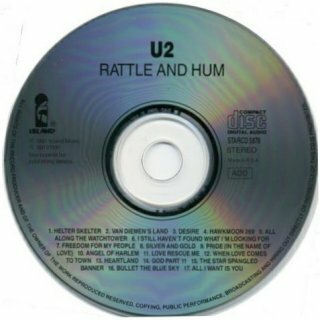 Thanks to U2 fan Rogier van den Braak for information about worldwide releases of Rattle And Hum from his "U2 Wanderer" web-site which can be found here: . 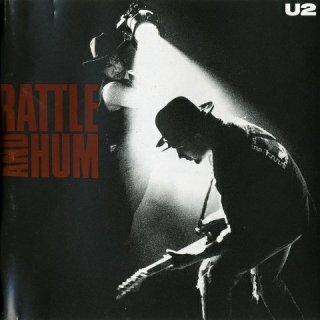 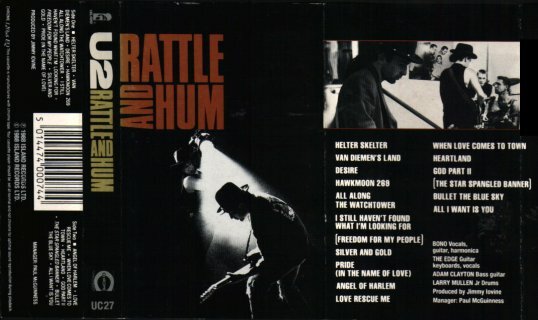 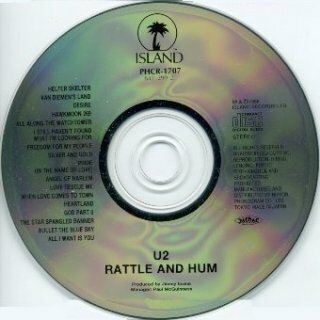 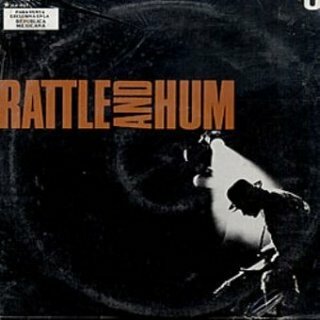 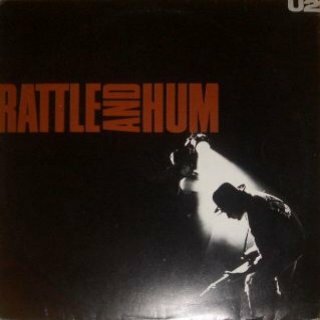 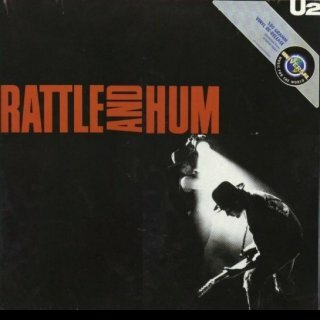 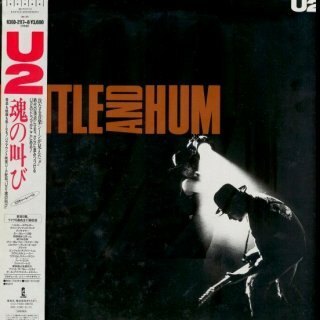 Alan Hoaksey adds: "There's a single put out by U2 shortly after Rattle And Hum in various formats/countries. 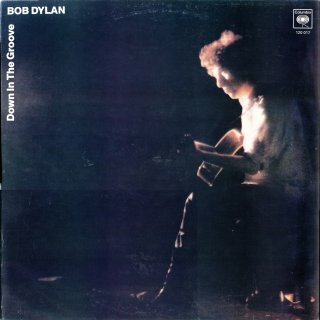 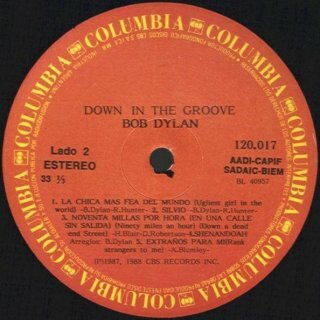 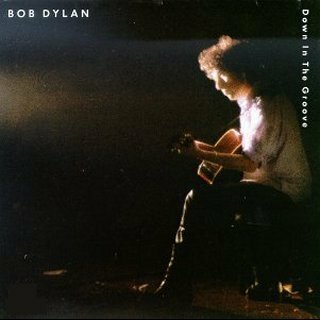 The single features the track Love Rescue Me but this is not the LP version - it's a live recording and does not feature Dylan." 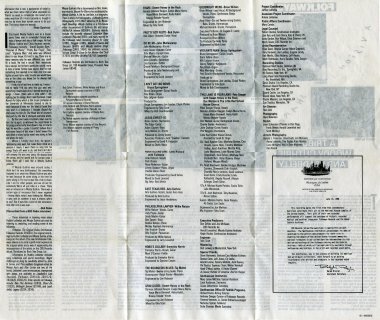 The three Australian releases shown here and below were distributed by Festival Records of Australia on behalf of Island. 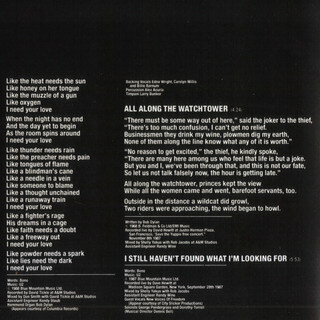 Thanks to Stuart Moore for information and scans. 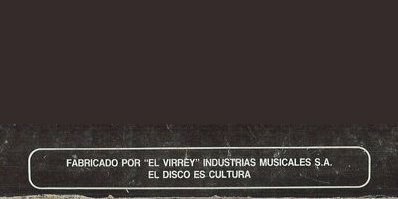 Thanks to Wil Gielen for finding scans of these Latin American releases from Mexico (two releases), Argentina, Peru and Uruguay. 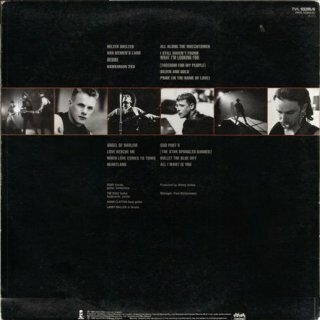 All come in a wide single sleeve, not a gatefold sleeve. 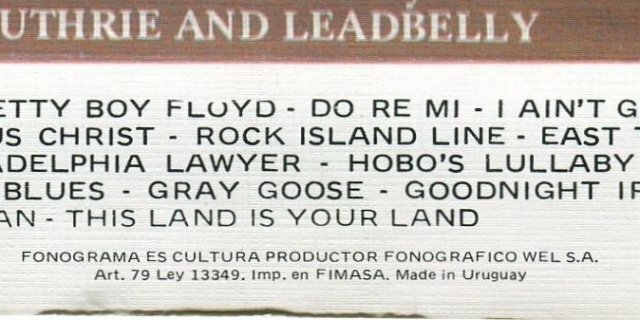 Island UC 27 (UK) - cassette front (my copy) The UK cassette release is my copy, but the cassette itself is missing! 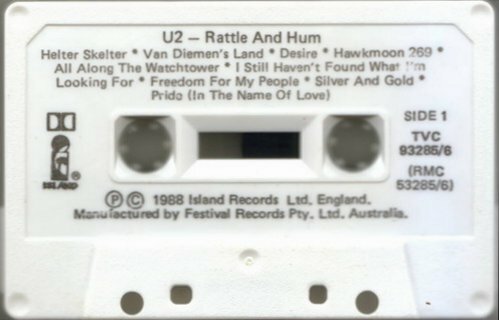 Thanks to Stuart Moore for scans of the Australian cassette release, distributed by Festival Records of Australia on behalf of Island. 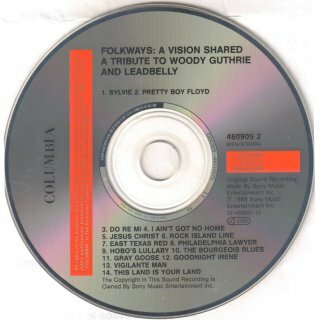 Thanks to Stuart Moore for scans of the Australian CD release, distributed by Festival Records of Australia on behalf of Island. 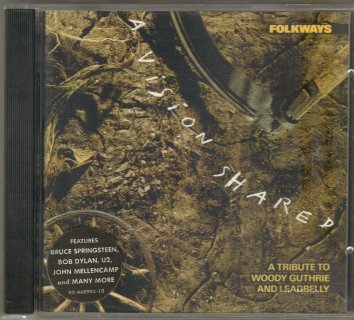 Thanks to Manuel García Jara for scans of the 1991 South African CD release. 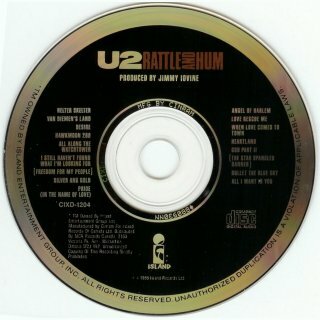 The South African rear insert has text "U2'S ROYALTY FROM THE SALE OF THIS CD IN THE REPUBLIC OF SOUTH AFRICA WILL BE PASSED TO THE SOUTH AFRICAN MUSICIANS ALLIANCE AND THE MUSICIANS ALLIANCE FOR THE PEOPLES POWER OR OTHERWISE AS ADVISED BY THE IRISH ANTI-APARTHEID MOVEMENT". 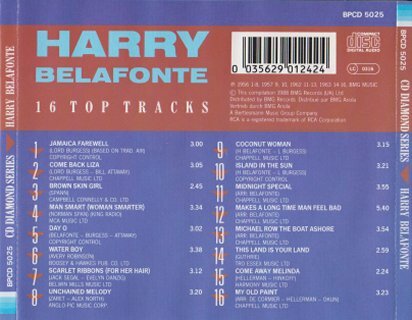 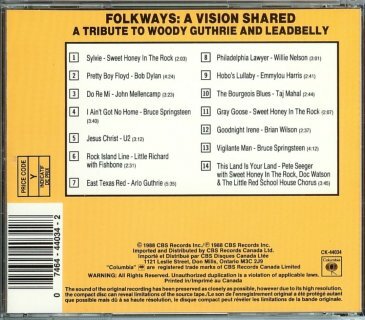 Thanks to Jack Guerreiro for the scan of the Canadian CD. 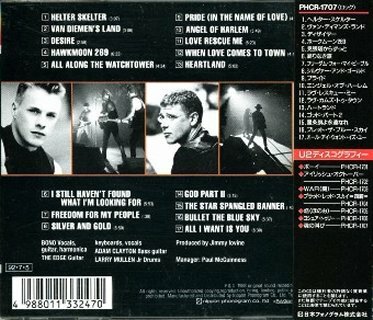 Thanks to Wil Gielen for finding scans of these four Japanese releases and for further information. 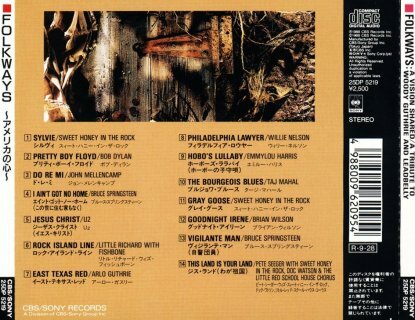 Island P33D-20075 (Japan), 30 Oct 1988: Promo and commercial copies are shown. 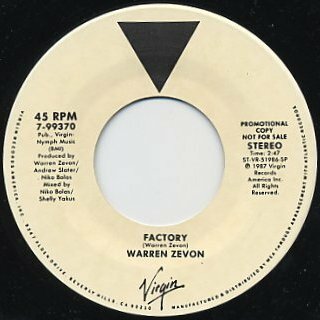 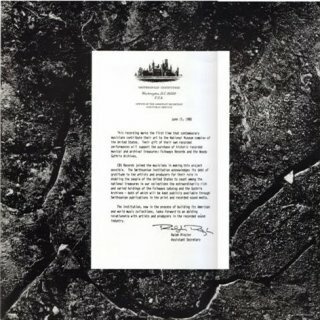 The release date is given as "R-10-30" (30 Oct 1988). 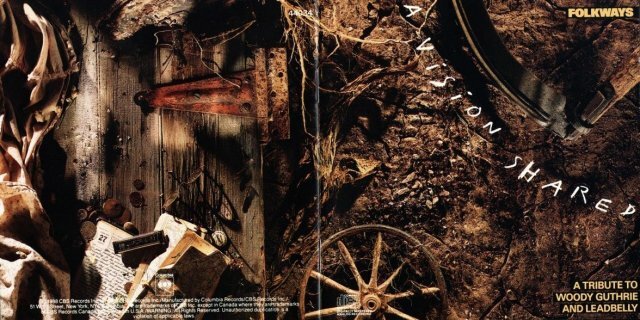 The price was ¥3,300 as indicated in the catalogue number. 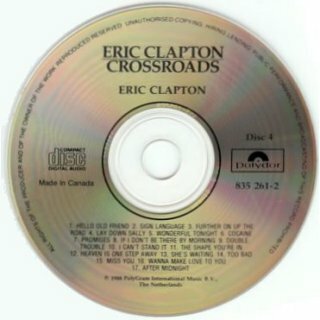 The promo copy has a red/white sticker on the front with "SAMPLE" in Japanese and also "SAMPLE" in English and Japanese in the centre of the CD. 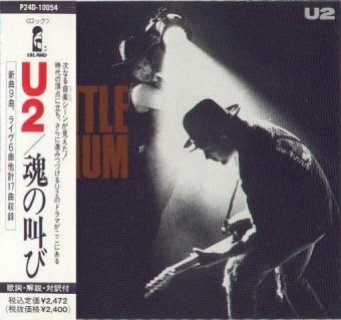 Island P24D-10054 (Japan), 1 Sep 1989: The release date is given as "E-9-1" (1 Sep 1989). 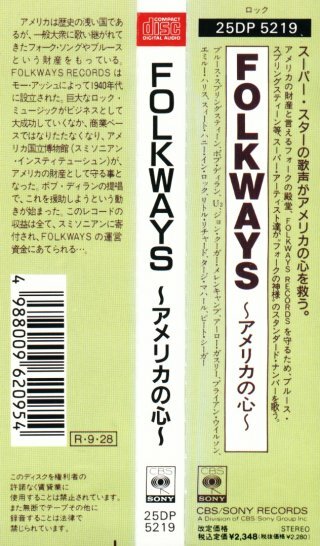 The price was ¥2,472 (¥2,400 plus sales tax). 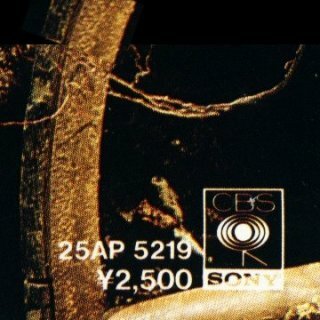 After sales tax was introduced in Japan record companies including CBS/Sony stopped using price codes in their catalogue numbers. 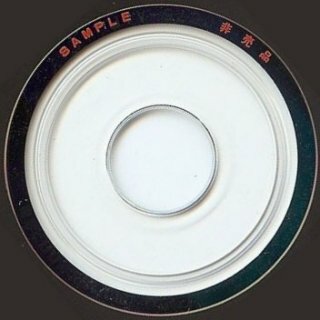 Island PHCR-1707 (Japan), 5 Jul 1992: The release date is given as "92-7-5" (5 Jul 1992). 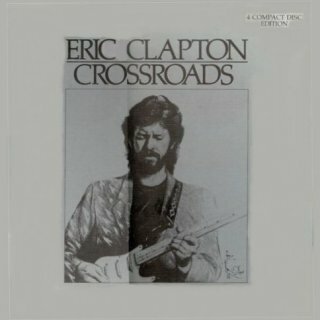 The price was ¥2,500 (¥2,427 plus sales tax). 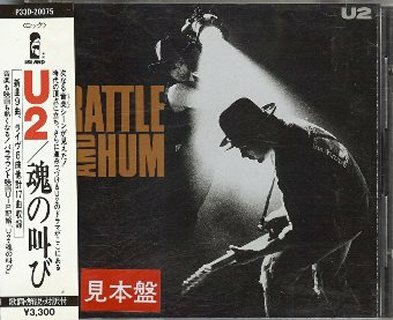 Universal/Island UICY-6569 (Japan), 8 Nov 2006: The copy shown is still sealed. 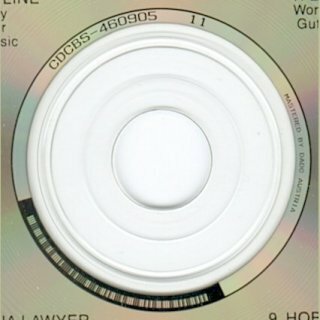 The release date is given as "06-11-8" (8 Nov 2006). 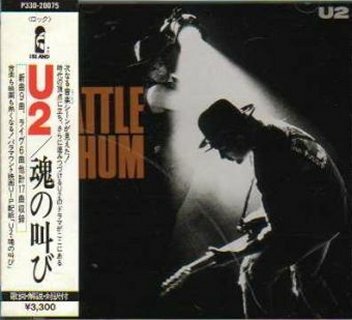 The price was ¥1,980 (¥1,886 plus sales tax). 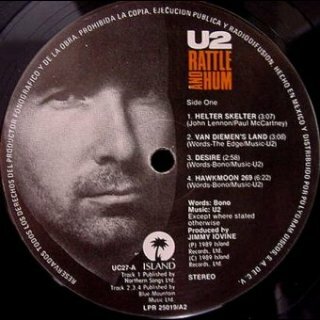 Thanks to U2 fan Rogier van den Braak for information about worldwide releases of Rattle And Hum from his "U2 Wanderer" web-site which can be found here: . 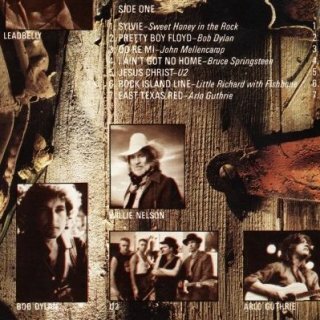 Wilbury Records/Warner Brothers 9 25796-2 (USA) - long box front, scan by Hans Seegers The Traveling Wilburys on Volume One were Bob Dylan, George Harrison, Jeff Lynne, Roy Orbison and Tom Petty. 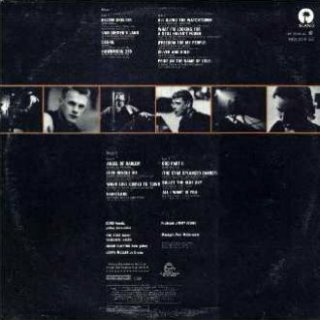 Roy Orbison died on 6 Dec 1988 before the release of the single End Of The Line, and only his photograph is shown in the video of the song performed by the four surviving group members. 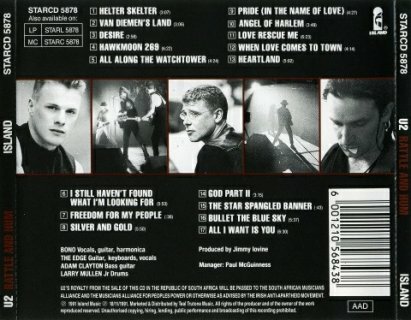 The album tracks were added to this list later than the exclusive single tracks, which is why their R-numbers are higher. 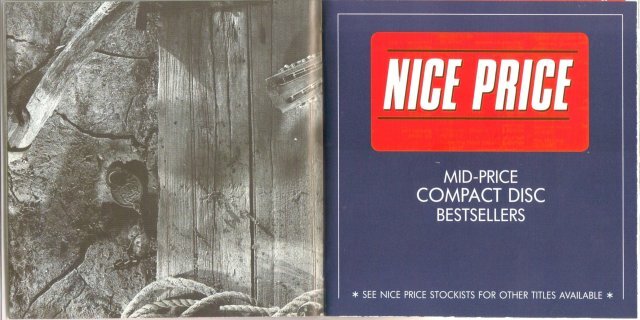 The US edition came in a "long box". 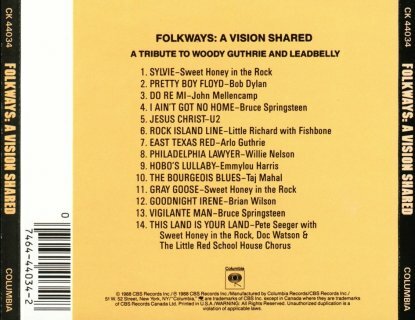 For full details of all releases of this album, see here. 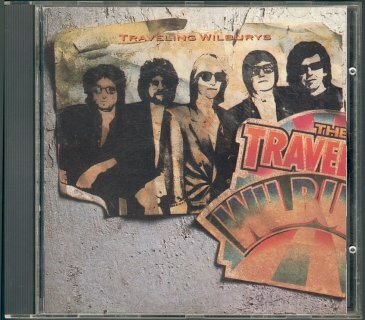 For other Wilburys releases in 1998, see Wilburys 1988. 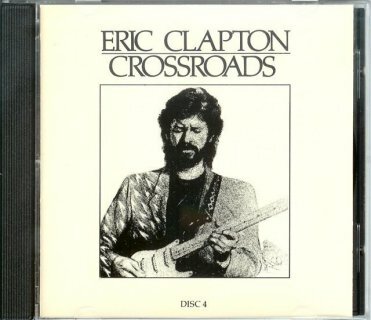 For the reissue of this album in The Traveling Wilburys Collection with three bonus tracks, see Wilburys 2007. 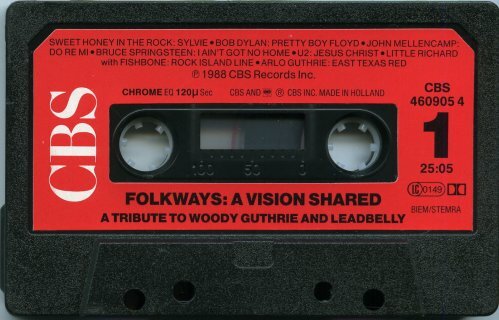 For the A Vision Shared VHS and DVD releases, see the VHS & DVD 1980s page. 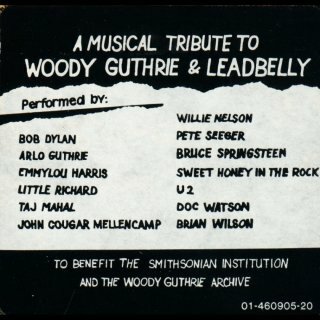 The documentary is narrated by Robbie Robertson. 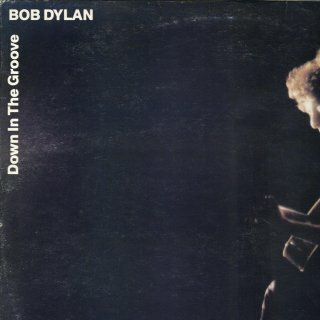 Ole Lien also informs me this album also has an interview with Bob. 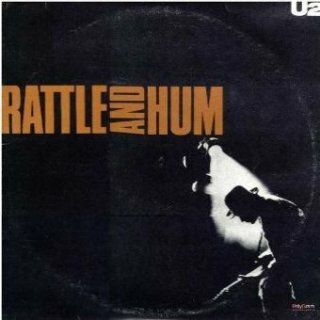 "It's the same as on the video (probably). 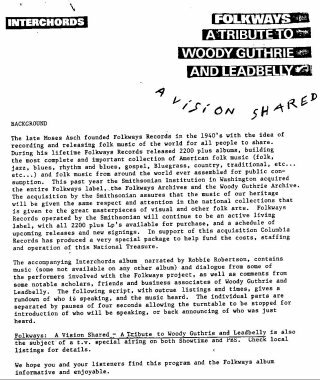 If I remember right it is a little bit more than on the liner notes from the album. 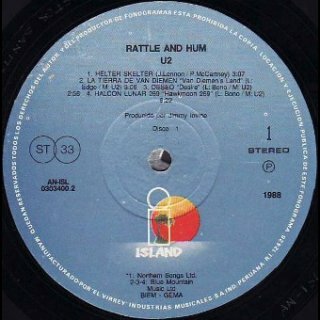 I think it also was from a BBC radio programme." 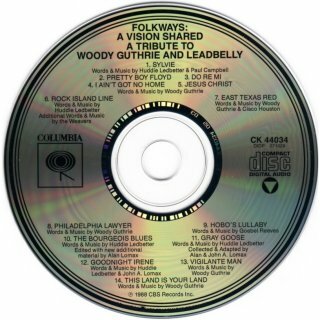 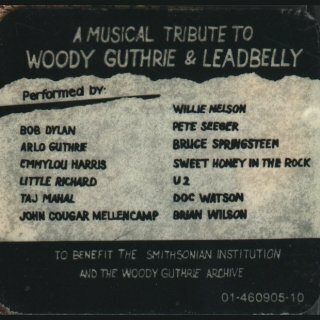 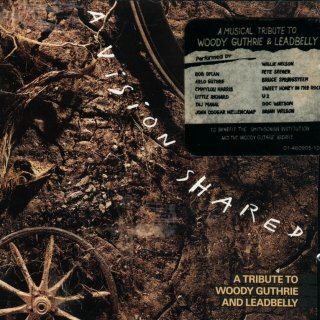 Before the song Bob says: "Woody was like a particular sound and besides that he said something that seemed to be needed to be said, to go along with his sound. 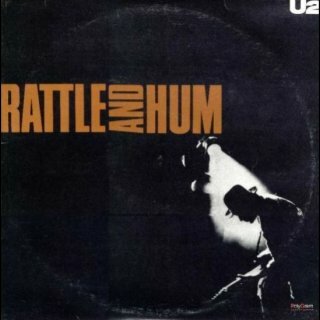 I like the way he played to say and I like the things that he said when he sang". 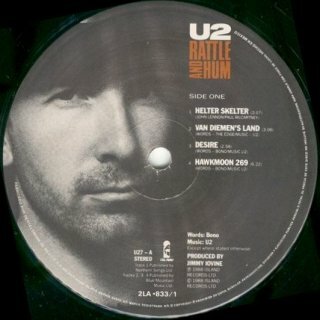 Thanks to Hans Seegers, Ole Lien, Brian Clarke and Peter Schoefboeck for information and scans. 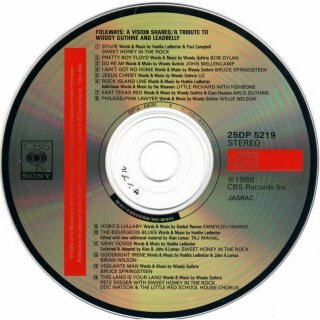 For the A Vision Shared VHS, laserdisc and DVD releases, see the VHS & DVD 1980s page. 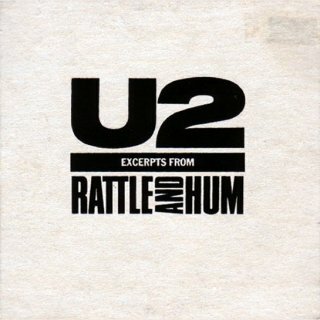 This song is not on the promo LP for the tribute documentary - see above. 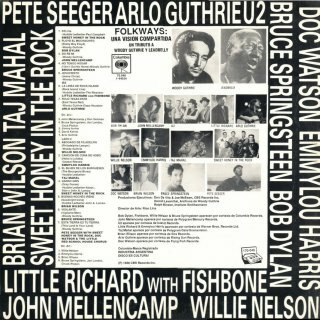 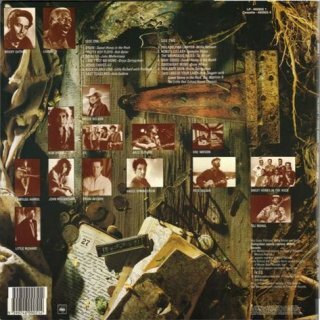 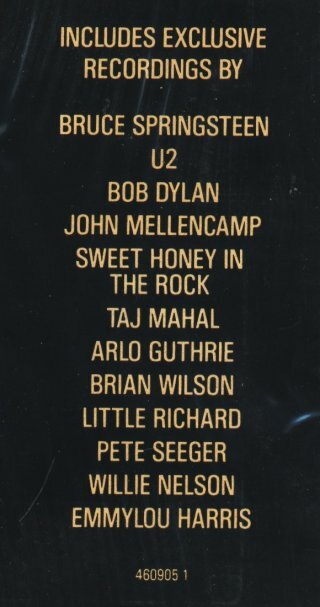 R-0202 appeared on the Sony Music Bob Dylan Custom Mix CD web-site, Apr 2003, see Online Performances (Other). 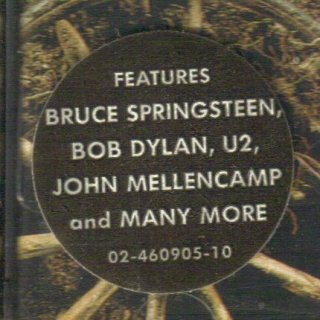 It was also one of the 42 rarities included for download with the Aug 2006 Apple iTunes Bob Dylan Collection, see Online Performances (Other). 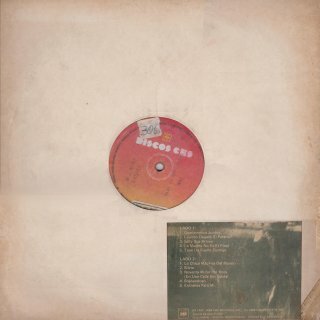 The US LP has a white on purple inner sleeve. 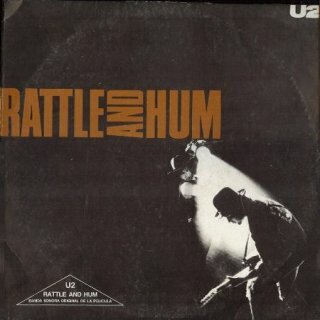 The UK LP has a white on grey/black card inner sleeve, the Dutch LP has a white on grey paper inner sleeve. 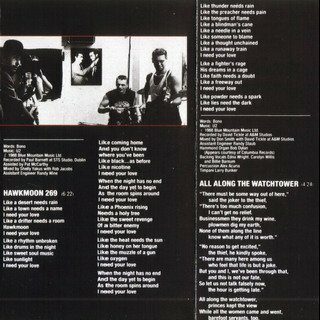 The Japanese LP has a 4-page booklet but does not come in a CBS/Sony inner sleeve. 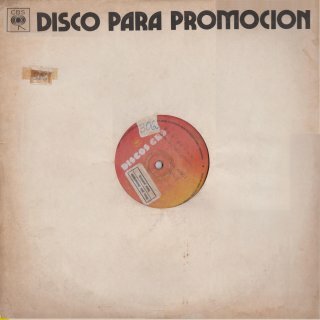 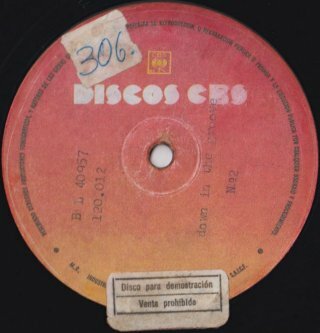 The promo Spanish LP has yellow CBS labels - the promo text "DISCO PROMOCIONAL PROHIBIDA SU VENTA" is printed on the labels. 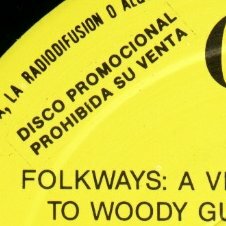 The sticker on the LP front also has Spanish text. 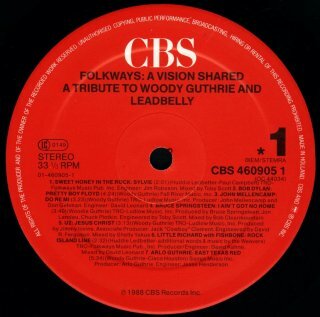 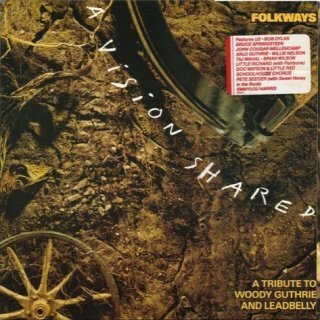 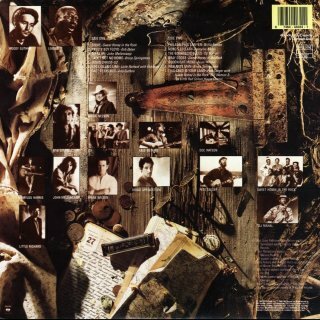 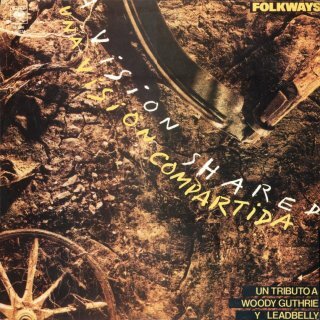 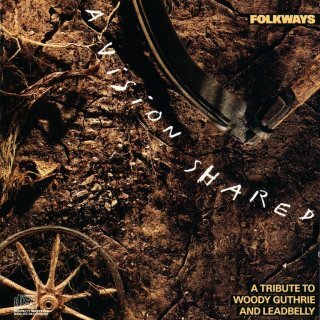 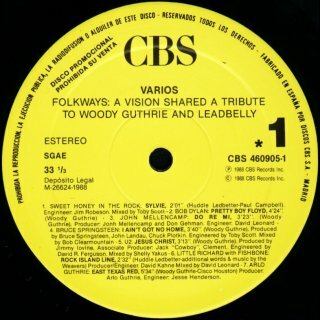 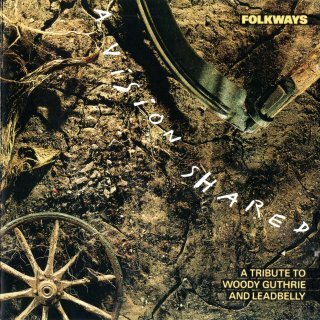 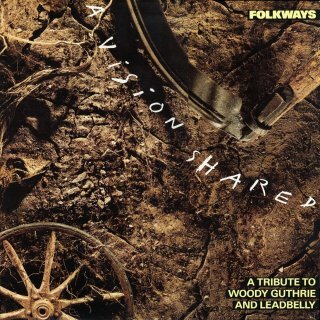 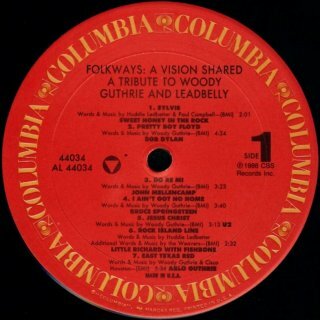 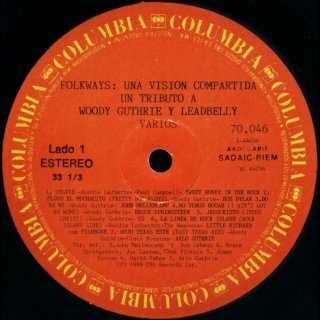 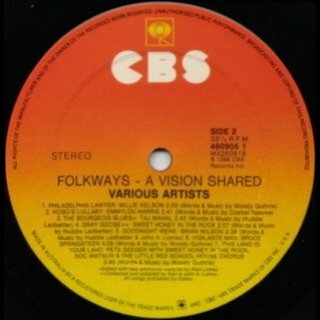 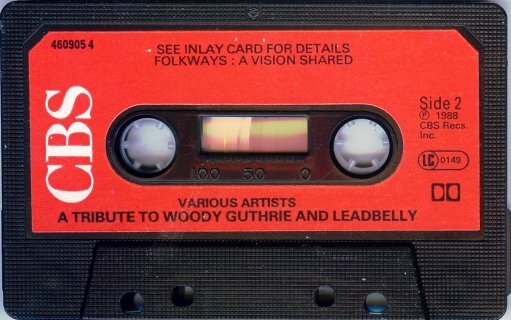 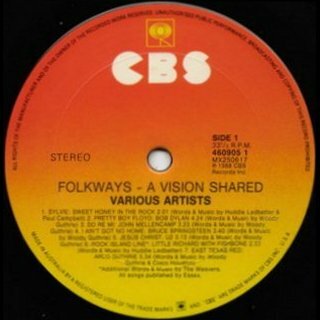 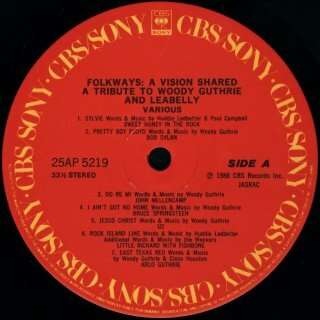 Thanks to Sergio Magnacca for the information that this album was also issued in 1988 in Argentina with a slightly different cover with Spanish text added - below A Vision Shared is the text "Una Vision Compartida" and at the bottom right "Un Tributo A Woody Guthrie Y Lead Belly". 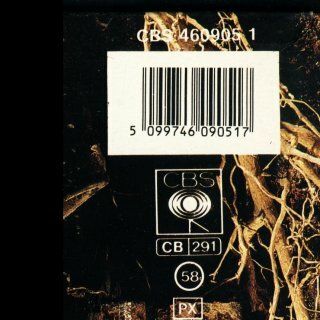 The Argentine catalogue number is CBS 70.046 with the US number 44034 right below it. 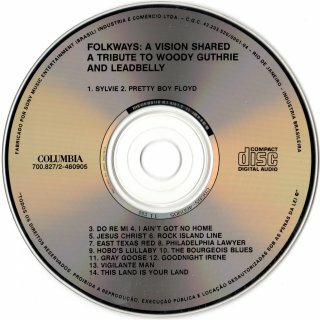 Sergio adds: "The title of Bob's song is in my opinion mistranslated as "Floyd El Muchachito" which really means "Floyd the little boy". 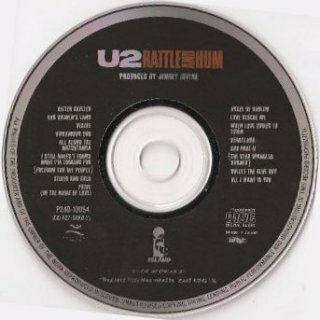 There is no reference to "Pretty" in the translated title." 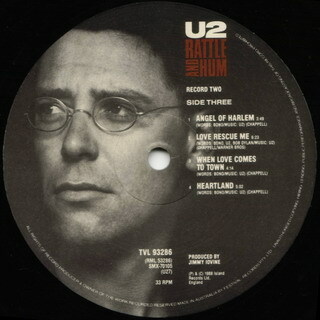 Thanks to Stuart Moore for scans of the Australian LP release. 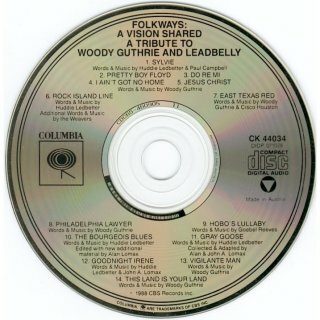 For the A Vision Shared VHS and DVD releases, see the VHS & DVD 1980s page. 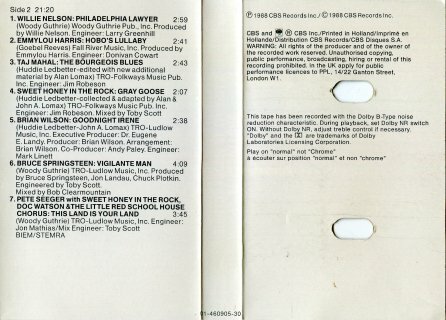 The UK CBS cassette release had a multiple folded card insert and a black cassette with red CBS labels. 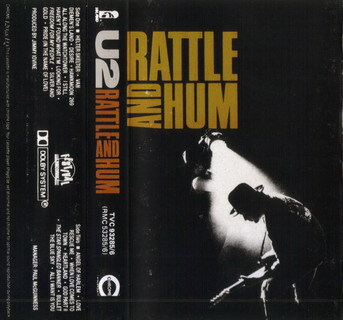 The Dutch cassette release had a smaller card insert together with a folded insert on thin paper with the same information and pictures as the UK card insert. 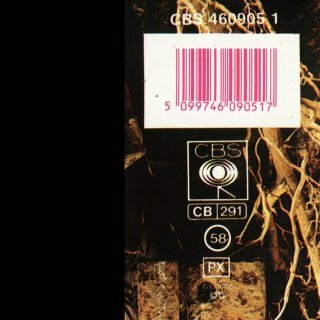 The cassette was also black with red CBS labels, but the labels were significantly different. 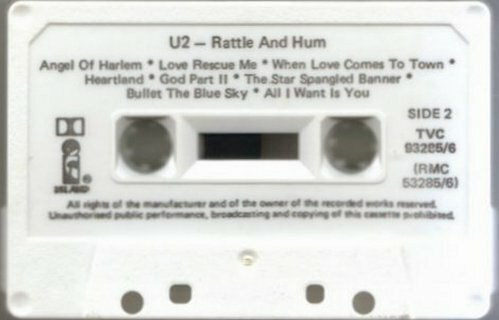 This cassette release has a long folded card insert, blank on the inside. 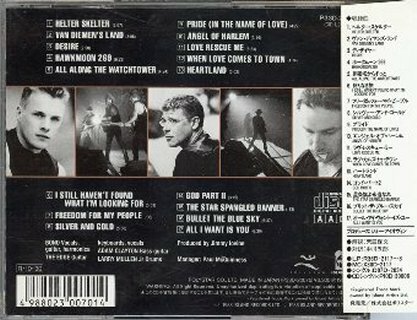 The titles of the songs (insert and labels) are in English only. 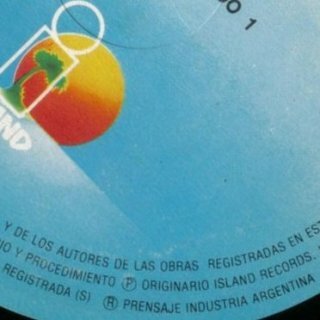 “Made in Uruguay” is printed in the insert and also on the labels (very small text). 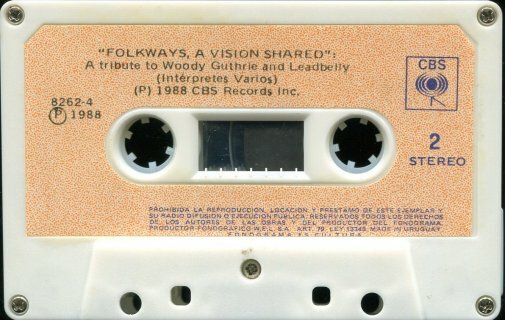 The cassette is white, with yellow/brown paper labels printed in black and blue ink. 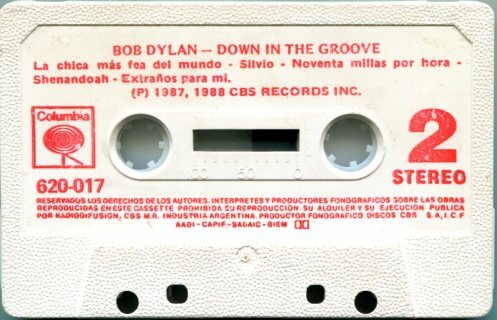 The folded card insert was printed in Uruguay by FIMASA and the cassette was made by WEL S.A. (like other CBS Uruguayan releases on cassette, including Warner Wilburys releases). 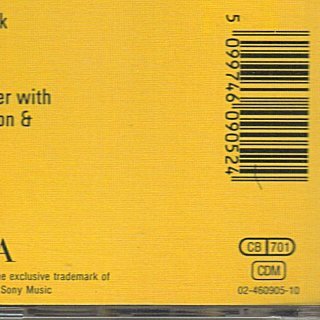 The insert and the labels have the Dolby Noise Reduction logo. 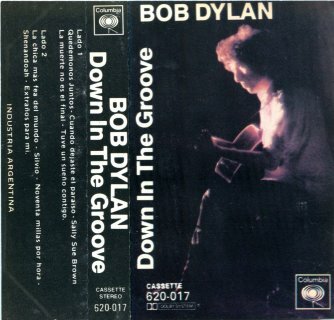 The cassette can be opened, as there are five screws on Side 2. 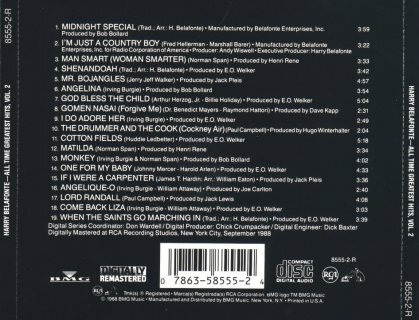 The text "Made in Austria" appears on the right below the Compact Disc logo. 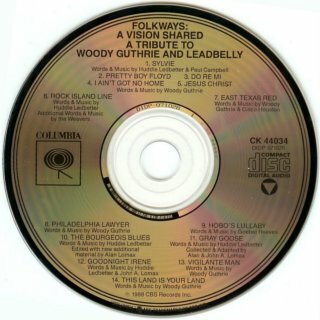 There is an extra line of copyright text at the bottom of the CD. 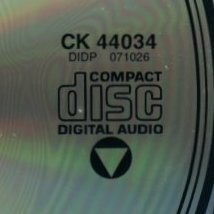 The information round the centre hole has the European catalogue number "CDCBS 460905"
The circles round the rim of the CD are also different, however the front and rear inserts are the same as illustrated. 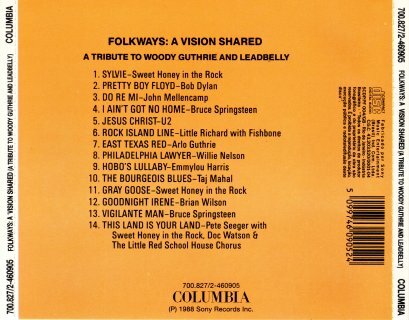 Thanks to Jack Guerreiro for scans of the Canadian CD release, also Columbia CK 44034. 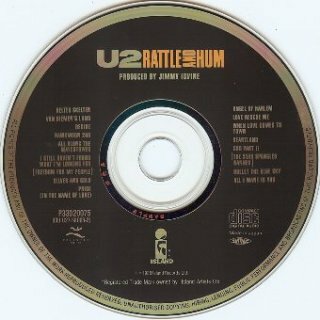 It has a different rear insert design from the US release. 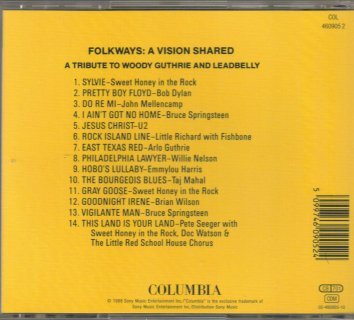 The CD itself was manufactured in the USA, as there was at that time no Columbia CD pressing plant in Canada. 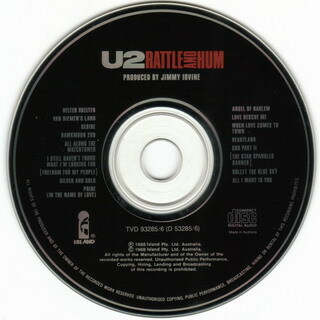 The European CD was made in Austria like the US CD variant above. 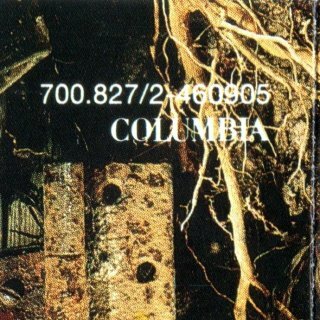 Columbia COL 460905 2 (Europe) - front with sticker, scan by David Burgess The 1990s Columbia CD release has a different front sticker and comes with a stapled "NICE PRICE" booklet. 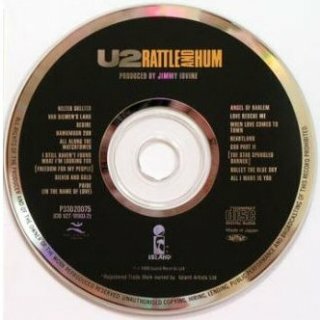 The CD was again made in Austria. 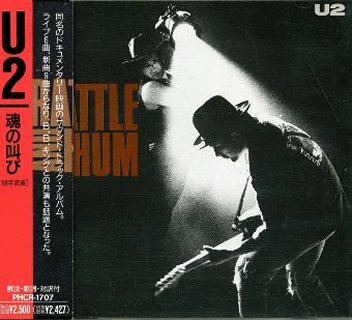 The Japanese CD had the same design light-green, white, black and red obi as the LP. 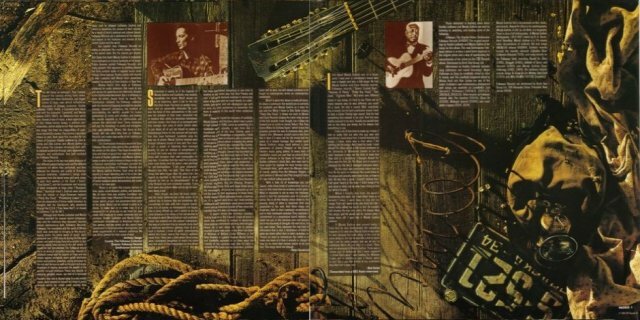 Hans Seegers has both a promo and a commercial copy of this. 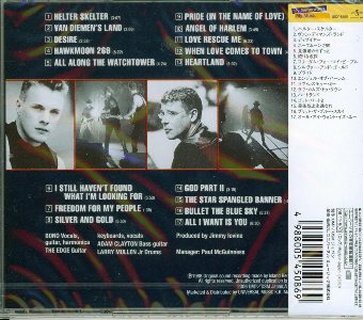 The promo CD has text in Japanese handwritten in the clear centre. 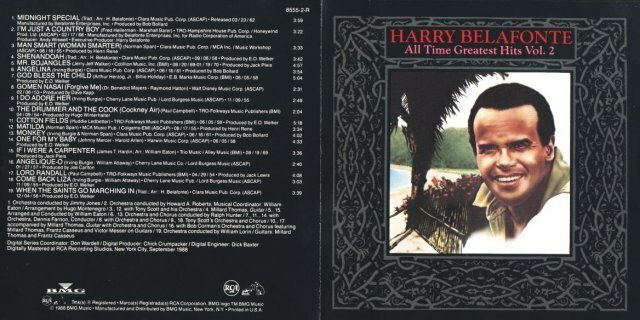 Columbia 700.827/2-460905 (Brazil) - front scan by Alexandre Froemming The Brazilian CD release on the Columbia label was made by Sony Music Entertainment (Brazil), Rio de Janeiro. 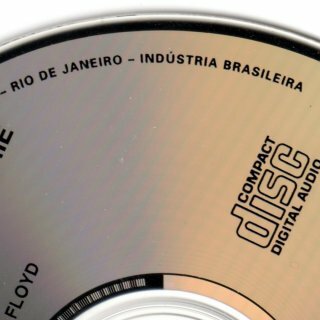 Thanks to Sergio Magnacca for information and to Hans Seegers, Jean-Pol Hiernaux, Jack Guerreiro, Alexandre Froemming and David Burgess for information and scans. 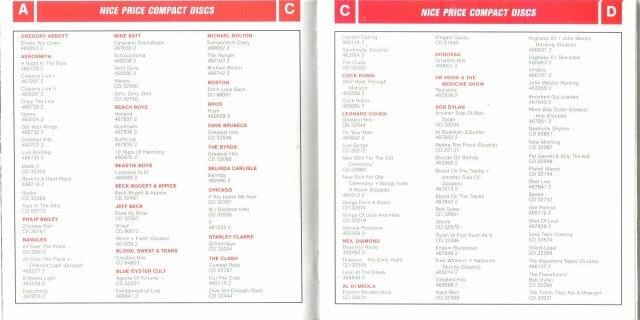 Living In Another Country: International Stereo Releases Stereo promo items for 1988 which don't contain rare material but which are still very collectable are now included with promo releases of regular albums and commercially released singles on the appropriate page in International Stereo Releases.